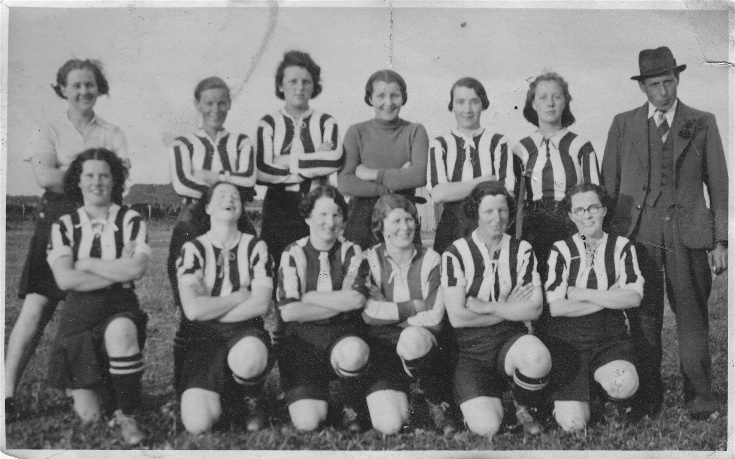 This photograph belongs to my aunt, May Fenwick nee Gammie, who is the goalie, and features also in the earlier picture of the team (picture #1023). She is not sure of the date. She quotes a Ross-shire Journal cutting: "In a benefit football match, in aid of the Royal Infirmary, Inverness, Alness Ladies defeated Invergordon Ladies 6-0." Front Row: ?, Annie Mitchell, ? Corbett, Janet Corbett, Jessie Bell, Irene Stewart. Is that the Jessie Bell who was married to Willy Bell? Would Margaret Michael be Christine Mackinnon's late mother, husband was Calum? Toody Mackay is my mother. The year looks about right, she would have been 18 or 19.